In this edition of The Bottom Line Advocator, Bottom Line President Sarah Hiner talks to Dr. Jamison Starbuck about the many factors that leave kids vulnerable to illness and Dr. Jamison’s best “back to school” methods for keeping kids healthy during flu season. Drugs prescribed for anxiety are a quick fix, but they do nothing to truly treat the root cause. Leading naturopathic physician Dr. Jamison Starbuck knows that the root often is low hormones…or low cholesterol! It’s easy to rebalance if you know where to look. She explains her methods to diagnose and treat this debilitating condition in this edition of The Bottom Line Advocator with Bottom Line CEO Sarah Hiner. The link between dietary choices and eczema flare-ups is well-researched and well-documented, yet doctors don’t talk about it…and they don’t treat it. 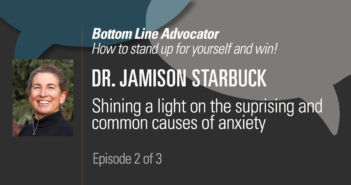 Bottom Line CEO Sarah Hiner discusses this outrageous oversight with Dr. Jamison Starbuck in this edition of The Bottom Line Advocator.